“The post-mortem season is in full swing,” is how McGeorge Bundy put it just two days after Khrushchev agreed to remove the missiles from Cuba. He was referring more to press reports, but in the wake of the crisis, Congress and a number of government agencies and departments conducted reviews of recent events. Each of these post-mortem reports had a different focus and had access to different types of information. 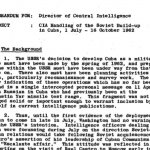 This internal CIA study produced shortly after the crisis examined the agency’s performance in the lead-up to the discovery of Soviet missiles in Cuba, including U-2 surveillance flights. 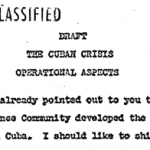 This December 26, 1962, report produced by the Pentagon reviews the operational aspects of the U.S. military’s response to the threat posed by the Soviet military deployment in Cuba. 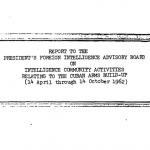 This report, presented by DCI John McCone to the President’s Foreign Intelligence Advisory Board, was a review of intelligence community operations in the lead-up to the Cuban Missile Crisis. 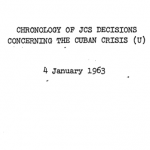 This January 1963 report details decisions and actions by the Joint Chiefs of Staff during the Cuban Missile Crisis and its aftermath. Its coverage starts on October 15 and carries through the end of November 1962, providing a day-by-day chronology and including summaries of JCS meetings. 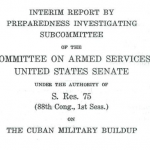 Prepared by the Preparedness Investigating Subcommittee of the Senate Armed Services Committee, this Congressional post-mortem report looked at the Cuban military buildup during 1963 through the spring of 1963. 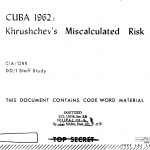 In this 156-page Top Secret report, prepared in February 1964, the staff of the Office of Research and Reports in the CIA’s Office of the Deputy Director (Intelligence) (DD/I) reviewed the evidence concerning the nature, scope, and timing of the Soviet military buildup in Cuba in 1962 and discussed the implications of that evidence. 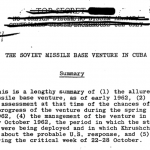 This study prepared by the CIA in early 1964 focused on assessing Soviet calculations with regard to deploying Soviet missile bases in Cuba.